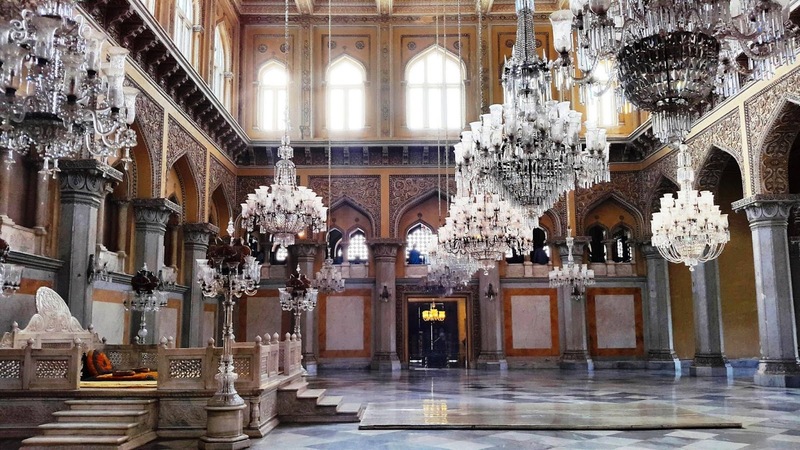 This is the "Khilwat Mubarak" or the "Grand Durbar Hall" of Chowmahalla Palace. During a heavily packed business trip to Hyderabad, I got half day free time to explore this ancient city. It was too short a time, but I decided to make use of it. One of the places I visited was the Chowmahalla palace. Chowmahalla Palace was built around AD1750 by the Nizam of Hyderabad and was the residence of the Nizam. As I entered the palace, by eyes were drawn to this magnificent hall. It was a breathtaking view to say the least. The highlight of this royal hall are the 19 hanging chandeliers. They are made of expensive Belgian crystal. The royal seat of Nizam named Takht-e-Nishan was placed in the centre of the hall. There was not much of a crowd and it felt so serene and other worldly in this magnificent hall. Thanks to democracy, commons like me get to see the Nizam's splendour in its all glory.